WSI? or XM? Which is "Better"? Is XM WX's NEXRAD "Better" than WSI NEXRAD? Does it even matter? Are they nearly identical? Well, for one thing, this comparison is out of date a/o early 2018 XM Sirius has disabled the WSI feed. WSI data from alternative feed ought to be similar. The important thing to know is that we aviators now have at least TWO really GOOD weather services available to us in-cockpit in near real-time. XM weather and WSI weather. What a wonderful journey it has been, to have watched and used these initially-fragile, irregularly-delivered, and "Can we really trust it?" products become rock-solid greatly trusted advisors. To every software engineer, every rocket scientist, and every manager who made it happen....every pilot owes immense gratitude to Baron Weather Services, to WSI Weather Services, and to the XM and Sirius satellite teams that deliver both products. Fro m 1999 to 2009 we operated a Colemill Baron B-55 that had an Avidyne EX500 MFD set up to read the GPS flight plan, display instrument approach charts, traffic and NEXRAD weather, plus winds aloft and TAFs. We flew one of the first; initially, our satellite weather delivery was a bit unreliable (looking back from today, I mean), but it eventually evolved into a really good product. IS XM "BETTER" THAN WSI? Is Composite better than Base? You decide. Compare the two weather sources on identical EX600 MFDs. At the Beech Museum in May 2011 at Tullahoma TN, I listened with great interest to Dr. David Strahle talk in-depth about "The Miracle of NEXRAD". A friend of mine summarized his presentation rather well. I was generally impressed at the depth of Dr. Strahle's knowledge. (Remember, I used to repair radars). I also thought he overlooked a few points. That's understandable; after all, he was speaking to light aircraft pilots, the vast majority of whom surely were using XM-WX NEXRAD. We have each flown both Base and Composite imagery; he switched from Base to Composite because, he told me that he thinks: true size and true intensity of a storm overrides, in importance, the accuracy of cell gradient presentation. I didn't have that good a reason, but having switched the other way, I really don't see much difference in the two products. Both are terrific. As I write here (Spring 2011), I have ~800+ XM hours and ~400+ WSI hours. 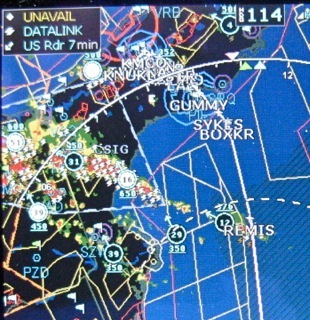 My first experience with in-cockpit datalink weather was in early 2003; that was Meteorlogix (now DTN) weather, which I believe used Base reflectivity. Later we switched to the Heads Up Technologies XMD-076 receiver to get composite weather from XM-WX via the geo-sychronous XM radio birds "Rock" and "Roll". Still later, in 2009, as I upgraded to the EX600 and before I switched to WSI, I asked a number of questions of WSI's meterologists and of the Sirius satellite team because its satellites flew a highly inclined geo-synchronous orbit so that their ground tracks appear to trace a figure eight (analemma-like) over the earth. The side effect of this orbit is that WSI has coverage further north and south because that orbit does not allow a highly refined antenna transmit pattern; the extended coverage is due to the large amount of signal spillover. Dr. Strahle spoke mostly about individual radar sites and how they worked, scanned, and reported; he showed us mosaic imagery and he explained raw and sliced NEXRAD data. This was all technically correct and most informative, but he spoke less about the really important subject of how these mosaics are composed by the government and then tweaked (in various creative ways) by our several competing weather service providers: Baron Services for the XM weather and WSI. He pointed out, correctly and importantly, that the vertical dynamics of a major storm need to be displayed prominently. I'd agree completely. But then, he failed to mention the "Storm Track Vectors" or "SCITs" in which both WSI and XM WX already deliver to us all of the features—more features, really—than he asks for and proposes be called the Strahle "S-Index” of vertical energy. His is a darned good idea: to flash or highlight these strong, vertically-powerful, storms on the screens of our MFDs. His further point is that Base images will miss the strong leaning cells and anvils, and that Composite images will accentuate a fast moving cell. Interesting point. I'm not saying he's wrong; I simply haven't seen anything missed on the WSI-EX600 combo. But there's more on our MFD screens than simply NEXRAD. Lightning Strikes (the little white zzz here) give us the important hint that we are dealing with a very dynamic system. They originate from the U.S. National Lightning Detection Network. The circles are "Storm Track Vectors" showing Cell Tops, a cell's Forecasted Direction, Cell Ground Speed, Hail Likelihood (black for rain or snow, white to show hail). All of this gives us a very clear picture of where to go...or not! XM calls these "SCITs". Example. Here, we were “end running” a vicious line of weather; we are out over the Gulf, ~300+ people having just died from this deadly line of weather, only the day before. Admittedly, he only had two hours to cover the subject, but I thought that his omission of the manner in which WSI creates its mosaic was misleading. His repeatedly dismissive tone with respect to Base Reflectivity images made it much too easy for a listener to infer that a Base mosaic was less than useless. Given that I fly a WSI mosaic of Base imagery, I knew that any such conclusion wouldn't have been anywhere close to being accurate. The unbalance of the presentation bothered me. So, a few days later, we chatted at length. In a very cordial conversation, he agreed that a more-balanced presentation was important -- especially so he wouldn't appear to be a company spokesman, which he says he is not -- and he told me that he would change his future emphasis to say how very good BOTH products really are. I agree with him that both the XM-WX and the WSI mosaics are excellent weather avoidance tools. We are really talking the fine points here...and I fully respect his preference. But here's why I still like WSI NEXRAD a little bit better than XM NEXRAD. A: always, it's a cleaner image on my MFD. B: Rarely do I see any returns that are not precipitation. C: The satellite reception area is larger, too. Snapshots vs. Time Exposures: Neither system waits for a "complete scan" as there is no such thing on a national level. The NEXRAD sites scan asynchronously and the data transmitted is "whatever exists at that time". The Dulles Base scan might be fresh, the Ft. Dix Base scan might be 10 minutes old because at that particular instant it is scanning on high. So in that sense, both Baron's XM WX Composite and WSI's Base are snapshots -- the Baron image is of whatever volume scan has been completed at that moment of transmittal, and the Base scan is whatever last scan exists. The Base scan, however, is a single scan layer. A composite image is much like a time-exposure of a dynamic and rapidly moving subject; it’s blurry at the edges of the cell gradients. It has to be; it’s collected over a full scan sweep cycle of 10+ minutes. A medical technician immobilizes the patient for long scans and/or uses snapshots for the same reason that WSI does...to achieve precision imagery. But there is no way to immobilize a line of active weather. A single layer of data is just that -- a single layer, whereas a composite scan includes all layers. Base is a quicker image. The composite scan takes some number of minutes to complete, and it is the inclusion of all layers (into a single image) that causes most of the "blur". The image is made of the highest level of reflectivity in a given column and -- especially in systems with a large vertical development -- there can be very different levels of precip in both the vertical and adjacent columns. This feature, many times, is the reason for precip being shown "where there is none" (at one's own altitude, at least). The most common example is of an anvil or overhang where ice (highly reflective to radar) or other strong precipitation is showing a return from up in the flight levels. Meanwhile, at normally-aspirated engine altitudes, it may be perfectly clear for miles around. Let's hear from a real expert. Scott Dennstaedt is a CFI and former NWS meteorologist. Scott runs a superb aviation weather training website. "It is a common misconception that the term "base reflectivity" is equivalent to the "lowest elevation scan." In fact, every elevation scan from 0.5 degrees to 19.5 degrees provides a "base reflectivity" product. The end-user products generated by the NWS WSR-88D Doppler radars are divided into two groups: those created for each constant elevation angle azimuthal sweep (better known as elevation angle products) and those constructed with base data from two or more azimuthal sweeps within a volume scan (better known as volume products). Therefore, many different combinations of products are possible within a single product category. Reflectivity, mean radial velocity, storm-relative mean radial velocity map, spectrum width, storm-relative mean radial velocity region are some examples of "base" elevation angle products. Reflectivity is just one of the base data products, hence the term "base reflectivity" is commonly used. While the radar operator at the NWS can choose to examine any elevation angle, most online internet sources provide either the composite reflectivity or base reflectivity product for the lowest elevation angle or 0.5 degree. They do not provide access to the base reflectivity from other elevation angles. Further, WSI does indeed depict radar returns well above the “Local Station’s Lowest-Sweep Height” even though they only plot Base returns. This is possible in certain circumstances, but only when the point of interest -- a storm -- is far away from the radar site in question (so the Base scan is way up high) AND there is not a closer radar site with a lower Base scan AND the closer station does not have a return higher (i.e., stronger) than the far away station. The important point is that WSI "mosaics" all of the overlapping NWS NEXRAD stations (out to ~125 miles) such that for a given storm’s location, there are multiple Base reflectivity values based on returns from different stations. So as not to confuse: WSI only plots one of those values, so it's a bit faster on delivery, too. WSI schedules 5 minute images so that it benefits from every site's Base scan (unless a site is in 'clear air mode' – but then, ‘Who cares?'). WSI does not need to wait until each and every radar site has sent out a Base scan image. So, a site that...for whatever reason...does not deliver a Base image will not ‘gum up’ the works for WSI. The lowest elevation slice: The center of the 0.5 deg. beam at ~ 30 NM is at ~2,000 ft AGL. Obviously, WSI depicts radar returns above that altitude. For example, a station at 100 NM from the cell produces a lowest-slice beam height of ~10,000-13,000 ft; it’s even higher when further away from the radar transceiver, of course. The long range of NEXRAD is out to 248NM. In the WSI NEXRAD, the data is used out to 215NM. The WSI mosaic software shows us the highest value of the Base reflectivity from different stations; multiple stations are looking at the same storm at different heights. This is why they don't miss storms; I have yet to see a cell that WSI missed. Similarly, XM-WX also uses the strongest Composite return. I'm sure that not all sites have overlap from adjacent sites, but most surely do. I do not mean to imply here that the XM data and the WSI data come from different radar sources. Both systems use the same radar sites and, since XM WX uses all the scans vs. WSI using just a single scan, I concede that XM is "technically less likely" to miss any storms. But they are both such great products, I don't see that it matters a great deal, frankly. In the very few cases where a Storm Track Vector appears alone with very little NEXRAD (see Puerto Rico, further on), that's a perfect example of the dymanic verticality measure that Dr. Strahe suggests be offered us. He's exactly right about that, it seems to me. 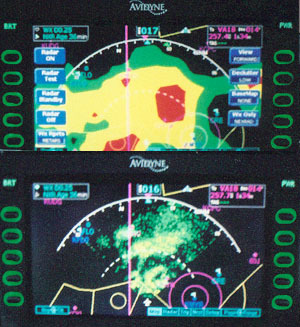 But the unstable verticality is already prominently in-cockpit (from both XM & WSI) as Storm Track Vectors (XM says "SCITs") and Lightning strikes. WSI's meterologist told me last year--and my somewhat-experienced eyes believe--that the WSI methodology preserves the reflectivity gradient, which is important for interpreting the presence of shear and turbulen ce. That makes sense to me; I have long disliked the much-too-sensitive XM-WX presentations of low level precip, and early on I said it was “too-alarming”, far too much “Wolf!”. Why? because our MFDs do not have any "Dim the NEXRAD image" control or a "Hide the low-precip" control. (I wish they did). Dr. Strahle offers a very good summary of NEXRAD, and how to use it. It was, by far, the best discussion of weather radar and delivery service that I have ever heard; this is a lecture absolutely worth your time. Go listen to him; his talk is truly superb. Shortly afterwards, a pal of mine called me with a cool idea. He had also heard Dr. Strahle speak and he suggested a quick way to compare the two weather sources and MFD images. Have a look at what we did, and ... come back next year! This technology is changing fast, improving quarterly, it seems. Again: All providers are getting better at delivering FABULOUS weather information services. Terrific stuff! It is becoming very difficult to see much difference in these truly superb weather products. I'd be willing to bet that, with labels removed, most experienced pilots wouldn't be able to tell the difference. You decide. Coverage, an easily confused term. Two kinds. Satellite Coverage means the area of the earth where the satellite can readily communicate with our receivers. Subscription Coverage means the area of weather data to which we subscribe. ForeFlight uses a mosaic of Composite Reflectivity images from Weather Decision Technologies (WDT). Most (all?) 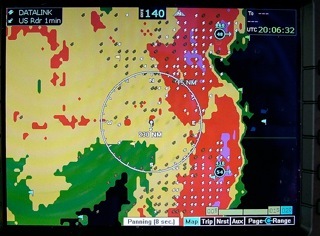 of the Garmin products use the XM-WX mosaic of Composite Reflectivity images from Baron Weather Services. So did the early Avidyne MFDs, but Avidyne has now switched to a WSI mosaic of Base Reflectivity...which feeds our EX600. 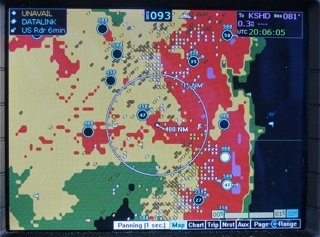 Storm Track Vectors are auto-generated by the government and are displayed in different formats/styles on cockpit weather displays. XM WX calls these symbols a "SCIT". Lightning Strikes originate from the U.S. National Lightning Detection Network (NLDN) and variations thereof. WSI’s lightning data source is the North American Precision Lightning Network which is an extension of the US Precision Lightning Network. XM/WX contracts with a different source which I believe to be Vaisala’s NLDN. There are slight differences in Ground Strikes vs. Cloud-to-Cloud. 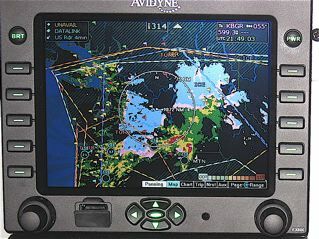 Dr. Strahe suggested to me that we all study the FlightAware.com images These are great as a learning tool; we can watch what other pilots do to avoid weather. EX: watch Memphis on a lousy day during the FedEx push. These happen to be composite images by chance or design; he wasn't sure which. For more on the new EX600, click here. Any questions? just give me a call, or click on the e-mail link below. While you are here, have a look at our horse teams, and carriages, or take a tour of our farm in central Virginia.